Have you ever imagined what your life would be like, if someone sent you a horse? Or what the horse’s new life would be like? But Slim’s life was standing still. Her owner is my sister, who stays very busy with her work. She realized that Slim was getting the short end of her time, and not enough work-outs, in saddle seat and western styles. After about three years of not enough work-outs, Slim was turning into a couch potato. My sister’s solution to get Slim in shape again, as well as provide attention and time that horses need, was to send Slim to —- Alabama! Yes, Slim was shipped to Alabama, a state located in the heart of Dixie. “Why Alabama?” is a good question, and frequently asked. Because that’s where I live. I work as a professional photographer in the Birmingham area, and ride saddle seat. I began riding saddle seat as a 4-H’er in New Jersey, and enjoy it to this day. 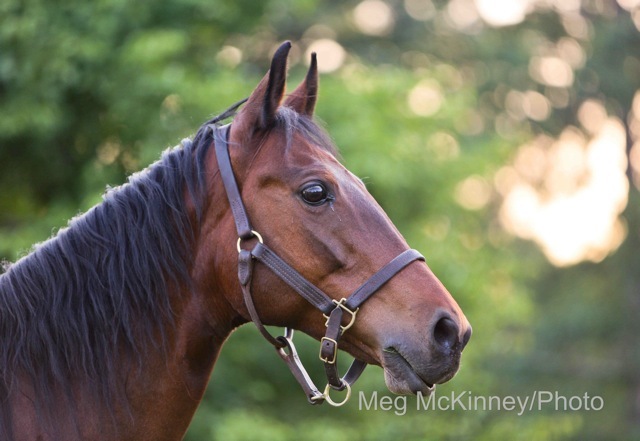 In January 2014, I met with Courtney Huguley, the owner/trainer of Stepping Stone Farm Riding Academy, Chelsea, Alabama, and discussed the possibility of Slim being shipped from California, and boarded at Stepping Stone Farm. Courtney welcomed the idea, and Slim. When the Allmarc horse transport company had a van going through the southern states, Slim was on it. My sister is still Slim’s owner, but Slim is here in Alabama for me to ride, and care for. Wow! This is an incredible opportunity, and my experiences about getting to know Slim, making new friends at Stepping Stone Farm, and more, can fill another post. Today, I’m telling about Slim’s new world. Yes, it was a dark and stormy February night when Slim arrived at Stepping Stone Farm, following a four-day journey across 2,000 miles. It was when the Deep South was experiencing severe winter temperatures this year, and I asked if Slim knew about very cold winters, and seeing snow flurries. No, Slim hadn’t been exposed to either, even though she arrived wearing a thick winter coat of her own. Fortunately, my sister sent along a CARE-type package, containing a thermal horse blanket (very warm), a cooling blanket — embroidered with Slim’s name and cute flamingoes, a grooming kit, and a new bridle. All have been handy and useful. The winter weather was just the beginning of “new” and “southern” for Slim. If only animals could talk our language. I don’t think any one realized that Slim would be facing so many culture shocks once she got here. I didn’t. I wonder if Slim had ever heard a “hey, ya’ll” before? Does she know that football is very important in Alabama? I think that’s something that all Alabamians – two-legged and four-legged – need to know. At Stepping Stone Farm, the landowners keep a variety of creatures that seem harmless to me, but scared the living daylights out of Slim, until she became accustomed to them. The day she saw two donkeys was almost life changing for her. We were just starting a lesson, when Slim saw two donkeys grazing about 30 yards away from the ring. I thought Slim was going to jump out of her skin, and bolt away. Slim didn’t get to bolt, but she was “traumatized by seeing the donkeys,” Melissa Croxton, the assistant instructor, said. The donkeys were herded out of Slim’s line of vision, and we walked up and down the stables hallway until Slim was calm. A horse that was afraid of donkeys? That was a new one for me. I texted a question to my sister about Slim and donkeys, and she responded that that was probably the first time Slim ever saw one. Courtney says that all Stepping Stone Farm horses have to get used to the donkeys, and that Slim’s reaction was like some other horses’. The one horse who doesn’t have to adjust is Miss Lace, because she is 28. Then, there are the guinea hens, who are small, low, grey feathered creatures that chirp a lot, while patrolling the grounds. Seeing and hearing guinea hens was also a first for Slim. Again, she wanted to bolt. She didn’t get to, but apparently those small birds were perceived as life threatening to her. Oh boy, I didn’t see that one coming either. On the other hand, some of the “new” and “southern” for Slim has been very enjoyable for her. 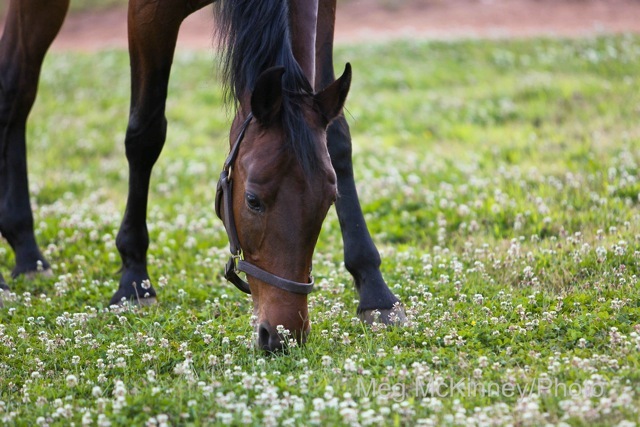 As Alabama’s spring weather and grassy clover came into full bloom, Slim pranced and galloped during her turn outs, and then filled up on the tasty, green grasses. She didn’t want to return to the barn at the end of these turn outs. When flies came in full swing this summer, I texted to my sister — what type of fly repellant Slim was used to? I went to a Tractor Supply store, and invested in equine fly repellant. Slim is fine with DuMor’s spray mist. Stall fans are a given in southern climates during the hotter months. For Slim, it’s another new item, but one she seems to have taken to very well — standing in front of hers, and appearing to doze away. For me, learning to ride Slim is an on-going education. I had gotten accustomed to lessons on 3-gaited and 5-gaited Saddlebred school horses that were better trained, and in better shape, than I have ever been. Since Slim’s arrival, I’ve had to re-awaken certain riding skills, as well as learn a whole new horse’s personality. Courtney, her staff, and all the riders at Stepping Stone Farm have been patient with my many questions, and very encouraging as well. “She’s a mare!” I frequently heard, when Slim didn’t accept a command. I’d gotten used to geldings, who usually take orders without a fuss. Yup, Slim’s all mare. Being in the south, we have polite, mannerly discussions. Slim had an adjustment period for the first few months here, and wasn’t easy to ride for awhile. In March, she managed to toss me to the ground, in front of a group of parents, who had their iPhones and video cameras going. Humbling, hardly describes how I felt. For Slim, it’s been one new experience after another, since being put on a van back in February. However, Slim is a smart horse, and has figured out some things in a horsey way. Because she’s gentle to handle on the ground, she’s popular with young riders who visit her stall, and bring treats. So, Slim gets lots of attention — and more treats! Because of regular work outs and training with Courtney, Slim has toned up, and is very energetic. The couch potato chapter is history. The big picture for Slim is to continue her training, stay in shape, and be gradually brought into the lesson program for intermediate and advanced saddle seat riders. I try to ride Slim on a weekly basis, but my work (like my sister’s) takes priority. Some weeks, I only have time to give Slim a turn out to graze, and a spin on the lunge line. For me, it’s been terrific to have a horse in my life again, especially a Saddlebred, my all-time, favorite breed. Even one that didn’t know about donkeys, guinea hens, and southern accents. Haha! I never thought about the whole change of culture & accent thing. I shipped my Thoroughbred from PA to Georgia when I moved. He had actually been born & bred in Canada, so he was moved around the entire East coast.